TheRustedChain - The Blog: Thtop. Justh thtop. I mutht thtop eating thith pineapple. But it'th tho juithy and delithiouth I can't. our house is a pineapple free zone. mainly because i don't like pineapple, and i don't buy food i don't like (except for bananas, because all 3 boys like them and they are easy to give the kiddos). you can have my serving of pineapple! We love pineapple too. I bought one last week, but was so dry....very disappointing. You are so funny and that fresh pineapple looks so yummy! My oldest gets the hives from head to toe when she eats pineapple and still that doesn't stop her, lol. Just found your blog through tweeterdom. Love the photos and pineapple tongue! I thought I was the only one who that happened to? Love that you are sanding your own floor, love your jewelry,love Steven Curtis Chapman, love your God's fingertip McLinkey. I think I may have found a kindred spirit. I will be following! mmmm fresh pineapple! NowI haveto go get some! YUM!! Fresh pineapple is delicious! You probably love the DOLE Pineapple Whips at the Enchanted Tiki Room at Disneyland, don't you, Beki? I sure do...wish we could go and get one now! I can't believe you didn't save me any! My mouth is in far too good a shape and really needs to be stung by the citric acid in pineapple! Mmmmmm! I make my own pseudo-Dole Whips lol! 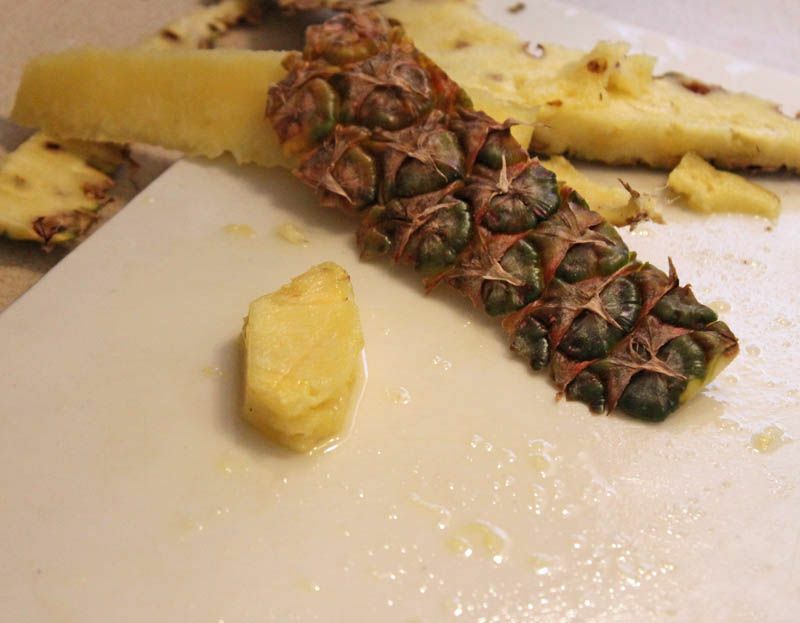 Run frozen pineapple chunks through the food processor with a little bit of milk and a sprinkle of Splenda. I use just a couple chunks of mango for texture, and it's amazing! ha ha ha!! This is so funny, because I can totally relate! Love that pineapple! oh yay!!! how super fun and exciting!!!!!! !